I sometimes daydream about food. A more truthful statement would be that I sometimes daydream about things other than food. A frequent daydream is the one about stopping at a roadside shack in the middle of nowhere. The sun and dry heat of the desert baking my skin, sealing my lips from thirst. I step into the shack and as my eyes adjust to the unlit room beer taps and a simple Mexican menu appear out of the darkness. The beer is cold and the food is fresh and delicious. This, I realise, is true Mexican food. No mince bathed in fluorescent grease. No mound of processed cheese. I have finally found a home. Three hours later I am screaming obscenities as three men hold me down. The police are on their way and the stranger who unknowingly ordered the last dark meat turkey burrito before I could is having splinters of chair leg tweezered from his back. 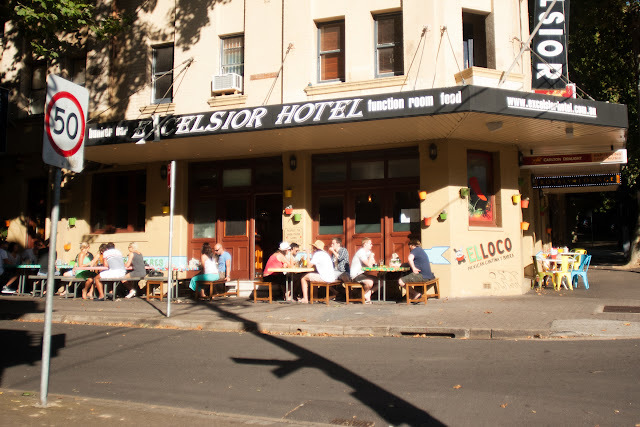 El Loco in Sydney is a garage that has been re-purposed to hold a casual dining room. The main restaurant feeds through to a larger pub, although we did not find any need to leave the street art covered converted garage due to the pub section of this establishment being completely devoid of amazingly delicious Mexican food. 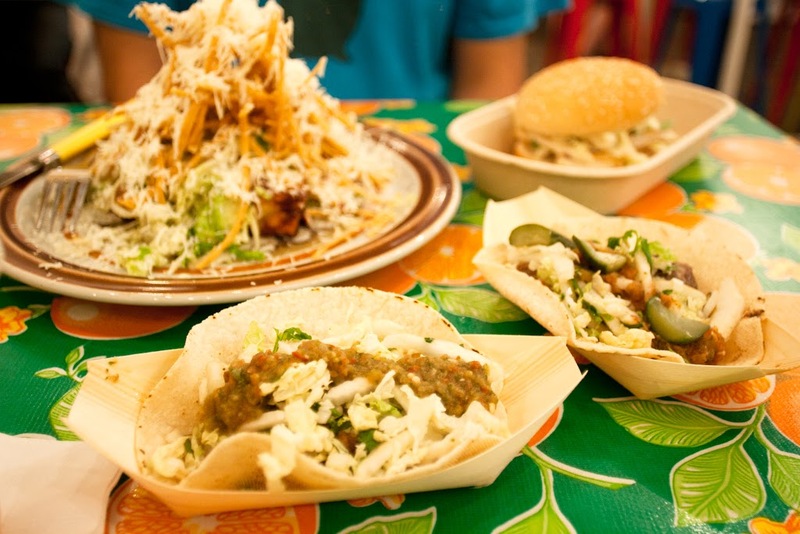 This phrase – amazingly delicious Mexican food – is how I choose to accurately describe the offerings from El Loco. For me it is what I always imagined Mexican food could be like. It should be fresh, simple, tasty. It should be cheap and plentiful. It should accompany beer and make the sun shine. It should be pretty much nothing like a lake of dark oil with liquid cheese sprayed on top, which is my memory of my prior drunken Mexican food outings. El Loco has a range of soft shell tacos including beef, chicken, pork, prawn and a secret taco that changes daily (braised lamb shank when we were there). Each taco is combined with a unique array of toppings. The beauty in their tacos is that they seem small but what they actually are is the perfect size. The amount of topping is the perfect amount. When I make tacos or burritos at home I cannot not put too much of everything on. My burrito ends up looking like someone has blocked a tunnel with shredded cheese, meat and lettuce. My tacos bulge like a woman’s magazine stuffed with advertising leaflets. 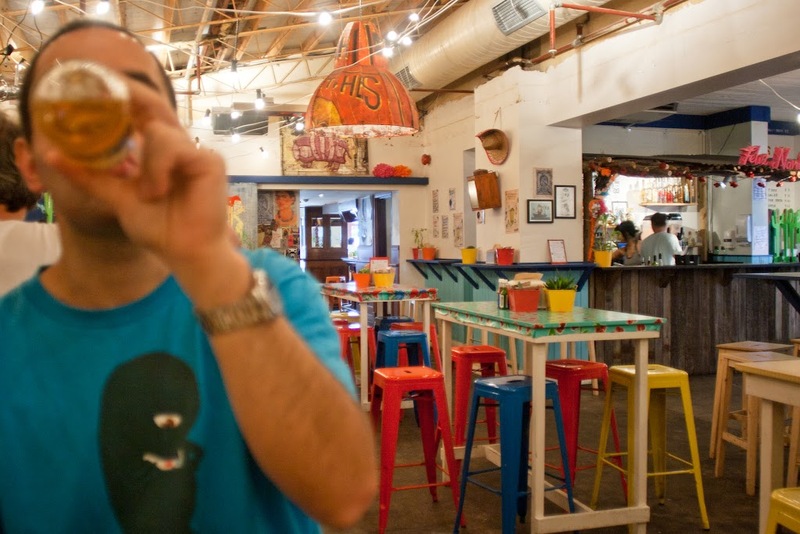 The chefs of El Loco have managed to find restraint in their food and with restraint comes the ability to showcase a range of flavours and textures that I had not previously encountered in Mexican cuisine. 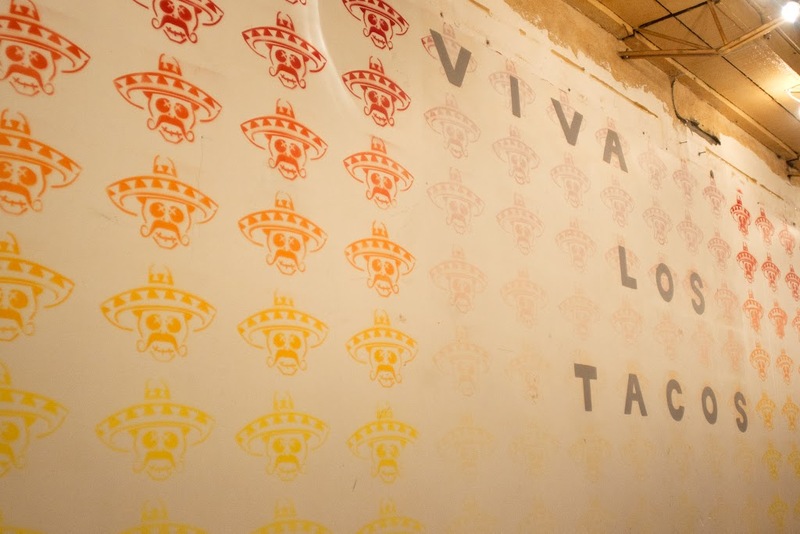 As well as tacos El Loco boasts a few other items – a grilled fish burger, a ‘salad’ of toasted tortilla chips and other items I didn’t get to try. On the drinks side there are beers as well as a range of appropriate cocktails, all of which are satisfactory – they exist as an accompaniment to the food. The food is the key here. It’s not ‘fancy’ or ‘special’ but at the same time it really is. The way getting Som Tam from a Bangkok street food vendor is special. I really enjoyed the food here. Three hours later and I wait for this version of the daydream to end. It’s slightly different this time. The chair legs are metal for one thing. The food though, was as good as always. 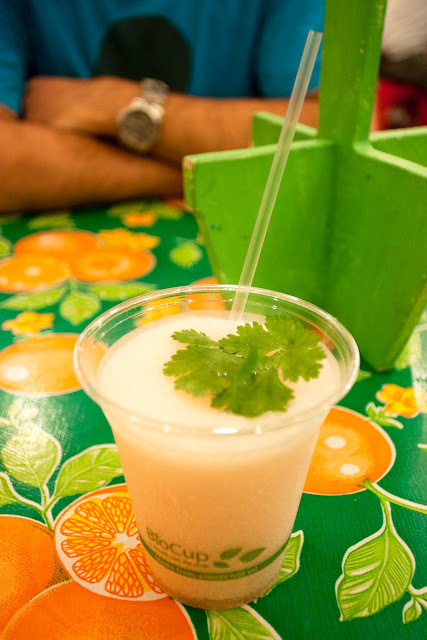 Pink Cuco - El Locos house slushy of El Jimador tequila, pink grapefruit and lime juices, homeade coriander and raw ginger syrup. 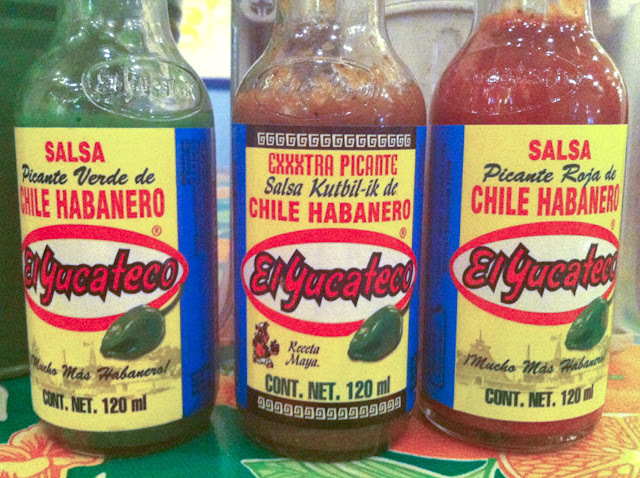 (from bottom left, anti-clockwise): Carne Asada Taco (? 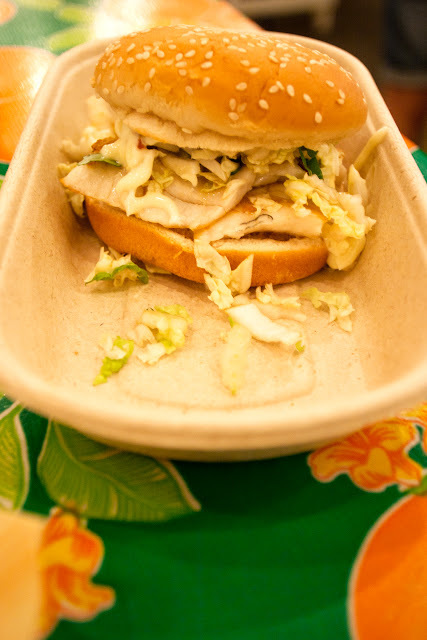 ), the daily Secret Taco, Fish Torta Sandwich, El Loco Salad. 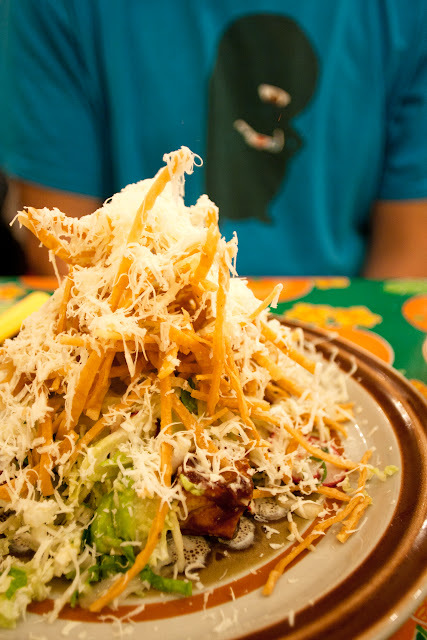 'El Loco Salad' - A healthy salad consisting of chilli spiced tofu, shaved fennel and radish, cabbage, coriander, spring onions, avocado, queso fresca (cheese), tortilla chips and our El Loco dressing. 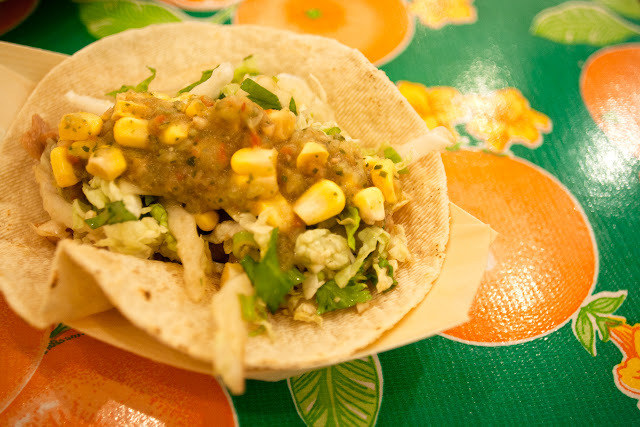 Pollo Taco - chicken, sweet corn salsa. - words by pisso | images by uberjoi.